Things are super extra hard right now, but tonight, I want to focus on the positives. Today, my kiddo finished second grade! He had to work so so so hard to gain new skills and learn new information and I am so very proud of him. I’m excited for our big Christmas break before third grade! These times of having no school and less expectations and responsibilities to war over are always healing for our relationship. I’m ready for that closeness. We celebrated with lunch at his favorite restaurant with his grandma. Dessert first, of course! And then our little family headed to Santa Land tonight as a special treat. It was wonderful and he loved it. And as we were leaving, the most spectacular encounter happened. We were out in the parking lot trying to get him into the car, when another car pulled up into an empty spot nearby and out stepped a man. An ordinary young man with his wife or girlfriend, no kids yet. Javan said hi, and the man said hi back. Then Javan struck up a conversation, saying, “We’re leaving now, but I was really hoping to make some new friends here.” The man walked the extra space over to us, shook hands with Javan and introduced himself as Zack. Zack asked Javan how he liked the lights, I reminded him to answer. I then prompted Javan to say goodbye and he asked the man for a hug. I silently and simultaneously was ecstatic that he had verbally asked permission before hugging a “friend” and was afraid he would be rejected. Zack accepted the hug and returned it, and that was the end of our night. That might not seem like a big story to you. I guess it’s really not. 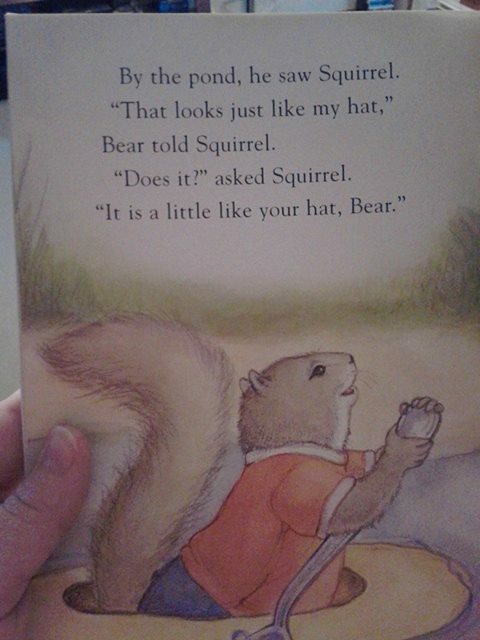 It’s a little story. And sometimes those are the ones that can have the most impact. You don’t have to do “big story” things or have “big story” relationships with people to impact them. Zack saw someone who acted different, and he chose to see Javan’s big, beautiful heart. Zack’s impact was that he made Javan feel like this is a friendly world to live in, like he was someone worth being friends with, and that he was ultimately lovable. His impact on me was to remind me to let my “little stories” in others’ lives be good ones filled with kindness and love. Especially people who have obvious special needs or people who seem different or lonely or sad. I want my little stories to be Zack stories, don’t you? I’m so tired of seeing article after article about mothers killing their children. It happens every day. It has to stop. Mothers of special needs children are at special risk of snapping, but many times there is nothing special about the situations that appear on my news feed. The neighbors and family members never saw it coming. The family was perfectly normal. The mother seemed happy. The children seemed healthy. There were no warning signs. And then one day it just happened. The mom lost it, and now her babies are dead. Sometimes she is too. I have no profound political plan, no help for which to lobby the government. But I do have a plan. It’s simple. Some may not like it or think it’s too simple. Some may be offended by the very premise on which it is based. Here’s my theory: No one is immune. Don’t assume you are safe from ever harming yourself or your children. Because that is probably exactly what those women in your news feed thought: That they would never ever harm their precious babies no matter what. And that is why when push came to shove they didn’t have the tools they needed to keep themselves and their families safe. Things are going well in my parenting life right now. Not perfect, stressful in fact, but well. My son is stable enough to get through the day without major incidents. But if you’ve read my blog much, you know that there have been plenty of times in the past when I was not okay. I have a wonderful support system. Friends who reach out to our family even when our situation can be extremely unpredictable. Family members who are willing to give us a few hours or even a whole night kid-free. But even so, I’ve been so harried by motherhood at times that people worried about me. My mom told me once that she was worried that I was reaching the end of my rope. I was worried that I was too. “What happens when you reach the end of the rope?” I asked her. She didn’t know. Neither do I. But I know that when and if I ever get there, when there is no more rope to hold on to, I will be okay. Because I’m making a plan. And I hope you will too. My plan is to talk about this situation specifically with a group of 2-3 of my closest mom friends. To ask them to be my “rope buddies.” To be there to catch me if the last frayed thread tears and I fall. It will be uncomfortable. It is much more comfortable to just think, “I’ve got a good support system, people who love me. And if I ever reached a crisis point, I’m sure they’d be there for me.” Well, apparently that’s not good enough. We have to solve the problem of women reaching their breaking points and not having a specific plan to put in action. I’m going to ask these women to be available when I say the words, “I need a rope buddy.” I need to be able to confide in them if I’ve had thoughts of hurting myself or my children, or even if I’ve acted on those feelings in some way, without fear of being condemned. One of my friends may be unavailable, which is why I would like to have three. One to be with me. One to take my son. One for backup. When I call on my rope buddies, I don’t need to be able to immediately understand and articulate the problem. They will activate the plan themselves, leaving me free to be vulnerable in relative safety. Once my child has been removed to a safe and comfortable place where he will be well cared for, I will be more able to deal with whatever sent me to my breaking point, and I will have a friend to talk me through it and stay with me until we are sure everything is safe. So why not just rely on my support system? My wonderful husband who also happens to be an amazing father? My mother? My in-laws? Well, the thing is, they work. I know, I know, you’re thinking that of course they’re going to leave work and come be with me in such a major crisis, and you’re right, they would. But hopefully, the situation will not have reached full-out crisis mode before I call on my rope buddies. What if I’ve only had a thought of hurting my child but I’m really very sure I won’t? I’m not going to call someone to take off of work because there is a 5% chance I will buckle under the pressure. That would be rude. But if I call on friends who are available when I’m with my child, I might not feel so bad about saying, “I need a rope buddy. Well, I really don’t think I do, but there’s a small chance that I might.” For me, being a stay at home mom, I’m with my child all the time, so my rope buddies will most likely be other stay at home moms who are available all the time. But if you’re with your child from 6 at night until 6 in the morning, find friends who are at home during those hours. Same thing if you work at night or whatever, find someone with your schedule who can be there for you. And you be there for them too. The thing I most want from any reader to take away from this is this: You’re not immune to breaking. You are not better than or stronger than or wiser than many of the moms who are left childless and with a burden of guilt that is too great. It doesn’t matter what religion or color you are or how much money you have or how wonderful your child is. You need to have a plan. Academic skills that are behind are somewhat harder for me to accept. I want every skill to be “on grade level” and I can become anxious when they’re not. But I have to force myself to step back and remember that academic skills are really no different than life skills; he WILL get it in time. Right now, the skill we’re struggling with the most is rapid recall of addition and subtraction facts. That skill is just…missing. He counts everything on his fingers, which doesn’t really work well with end-of-second grade math problems. It just flat out takes too long. We look for extra ways to practice. He has to put in more time and effort than other kids to learn those basic skills. But I need to relax. He will get it! And in the end, I won’t care that he didn’t get it “on time.” I will only care that he has the skills he needs to be functional, independent (whatever that looks like for him), and successful. This week took an extra toll on me. We added lots of new social activity. But THAT IS PROGRESS! The fact that I can add extra social activity, and have a reasonably fair expectation that he can be successful with it is progress! The fact that it was really, really difficult to do is just our reality. I want to share our progress with you, so I’ll walk you through our week. The good and the bad, because I’m a realist. So this is what a typical homeschool week looks like for us. Well, almost typical; Monday was a holiday. He has never read for that long in his life! Yes, we celebrated! After that, we went to the new park with the new homeschool group. New is not easy. He fought and didn’t want to go at all. Finally, he consented (with a poor attitude) and once he got there, he did great! It was a small group. There were lots and lots of sidewalks within viewing distance for him to ride his bike on. He even talked with the other kids! He introduced himself to everyone as a 22 year old Jedi, but he introduced himself and had normal conversations. I mean, he did fantastic! We knew it was time to leave when a massive thunderstorm appeared and let loose on us, but much to my dismay he would not contemplate leaving until he had ridden his bike to each of the four sections of the park to warn everyone in his best Jedi voice to “Leave the area immediately. There is a thunderstorm.” We were both soaked, but at least his intentions were good. A note of warning: there is always a trade off for things going well. By the time we got home, his behavior had deteriorated to the point that I sent him to his room for a good long while. He then destroyed his room by pushing over his dresser, his chair, and throwing stuffed animals everywhere. Yes, he had to clean it up after he calmed down. Wednesday, he had a tummy ache and back ache. It was terribly difficult to convince him that he still needed to do his schoolwork. He took an early nap. We got through our work for the day, but it was extra challenging. That afternoon, we went to a new program at the library. Boy, oh, boy is new hard. He fought tooth and nail not to have to go. But again, once I forced him and we got there, he did wonderfully. 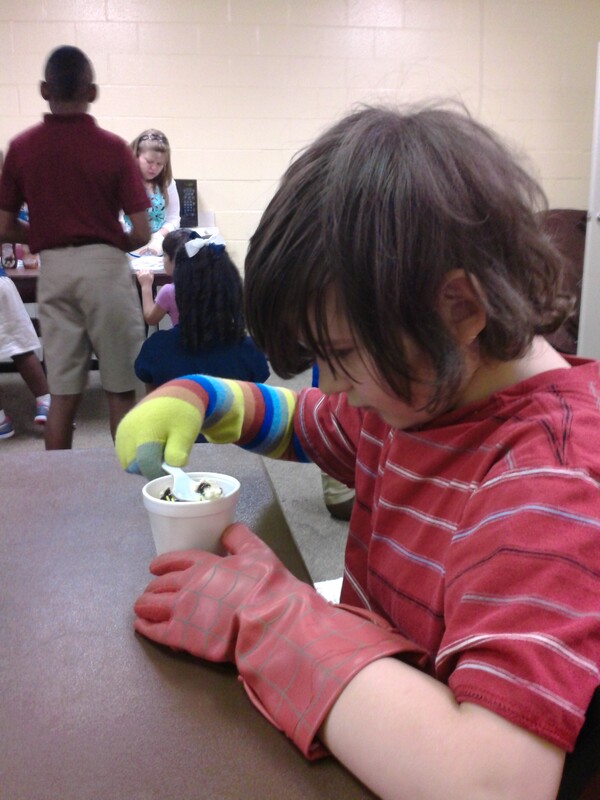 The librarian read them a funny book that he loved, and then all the kids got to make ice cream sundaes. Javan enjoying his ice cream at the library. You may notice in the picture above that Javan is wearing gloves to the library. Gloves, and any extra clothing, is a defense mechanism against anxiety and fear of sensory overload. It’s extra protection. 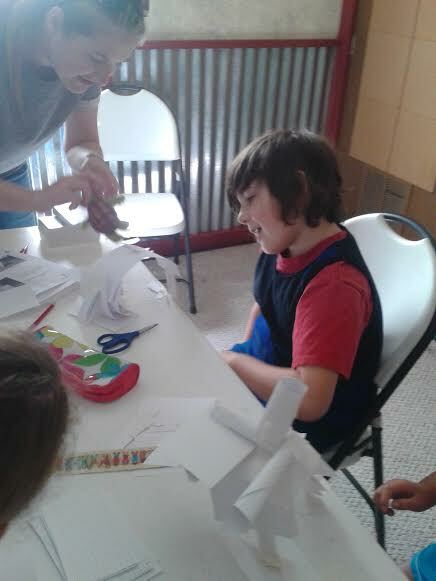 Thursday, our regular homeschool group had our Not-Back-to-School party. Javan rode his bike around the circle over and over and over, as is his usual park day activity. He also, however, shared his bike with his friend Lorelei. He shared his bike. That is always a big, big deal. AND, he participated shortly in the bubble activity we brought. 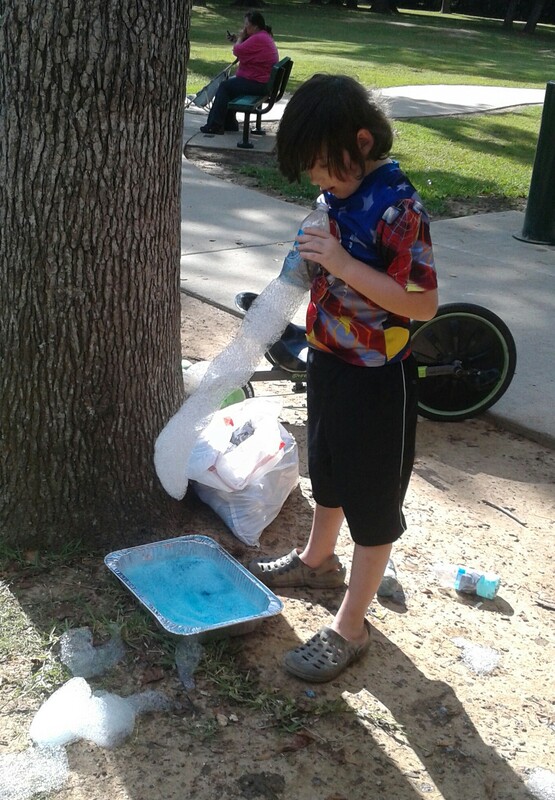 Javan making a bubble snake! And since this is a park day we attend weekly, and thus is not a new experience, I didn’t even have to pay for the success later! Score! Today, Friday, was a biggie. This morning, Javan attended his first homeschool class. You know, like, with other kids, and not at our house, and not taught by ME. He was a huge mess of anxiety. He was adamant that he would not go. And that if we did go, he would do everything he could to get kicked out. I’m sure by now, you’ve noticed a pattern of him refusing to participate in things, me making him participateanyway, and then him doing fine. So with that pattern in mind, I charged through and made him go. It was a nightmare to get him there. He wouldn’t dress properly. He ended up going in two shirts, gloves,and pajama pants (It’s 95 degrees here. In the shade.). 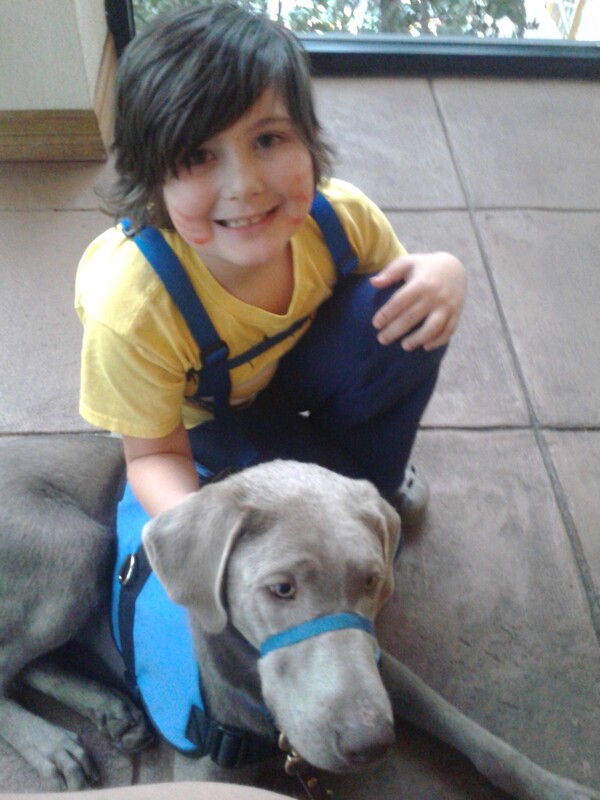 The only way I could get him to consent to go, was to remind him that since the class is only one day every two weeks, he’d only have to go to two classes and then he’d get to bring Rosco with him on the third class! This seemed to ease his anxiety considerably and I got him into the car. About halfway there, the anxiety shot through him like visible electricity. He was furious. He wanted me to “turn the car around this minute!” I used a soothing voice and kept my calm trying to reassure him. We got there, he through a few projectiles at me, and refused to get out of the car. So I just stood there in the parking lot watching all the other moms and kids happily march their way to the door and disappear into the blissfully air conditioned building. He finally got hot and decided to go in. We sat in a corner and decided to just watch what the other kids were doing instead of having the pressure of participating. The kids all introduced themselves, and he introduced himself as “Javan Kratt” one of the Wild Kratt brothers. But he did introduce himself! 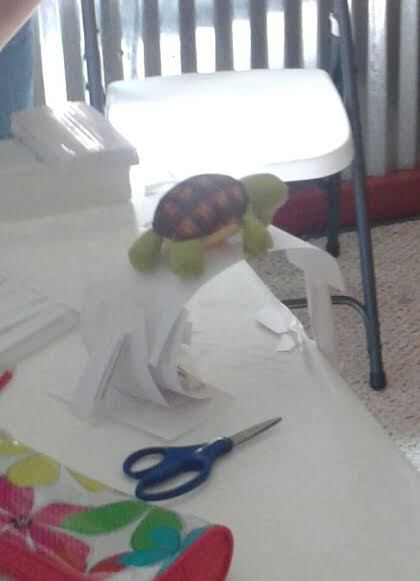 Then the other kids moved over to tables, and were instructed to team up and build a 10″ tower out of note cards that would support an astronaut statue (which was really a stuffed turtle). It’s an engineering class, by the way. Javan rolled around semi-wildly on the floor while the other kids listened intently and began building. I sat on the floor trying to calm his activity. Although he wasn’t being loud, he was distracting the other children and I continually redirected their stares back to their work or their teacher. Eventually, I was able to interest him in seeing what they were doing. And then, amazingly, he decided he would build his OWN tower. To “show them how it was done.” He did it! He sat at a table with other kids and did work! 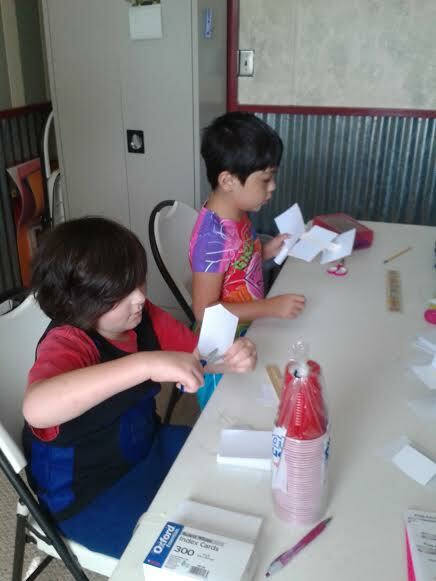 Javan cutting and fitting together note cards to build his tower. Javan and his fantastic teacher, Mrs. Jessica, seeing if his tower would support the NASA Turtle. Javan’s tower holding the turtle! Javan’s tower also seconds as a turtle catapult, which the other kids thought was brilliant and gave him much praise for. After this activity, everyone drew a heart in their notebooks and wrote or drew the things that they love inside. Here is Javan’s picture. 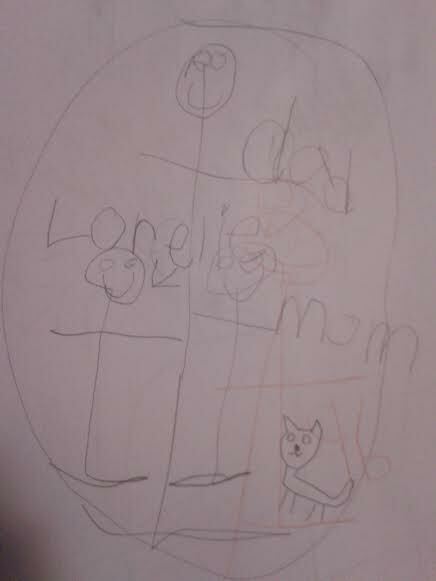 Inside his circle (because hearts are difficult) is Mom, Dad, and his friend Lorelei. He has a best friend that he loves! My heart is soaring for him! Oh, and there’s also Lorelei’s cat, PeeBee, which she added for him. And possibly a picture of grammy he added when he got home. 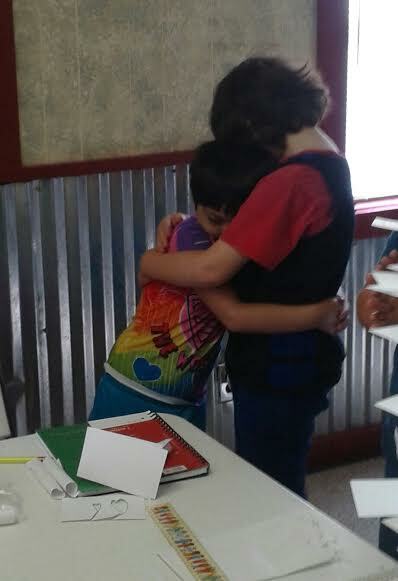 And here’s him hugging Lorelei in class. I count that as a success! After class, I asked him how he liked it and he said it was awesome. Then he realized the implications of what he had said and that he might have to come to another class with unknown activities in the future if I thought he liked it, and now he insists that he hated it and it was awful. We then had a play lunch at McDonalds with Lorelei and her mom, which happens to be my best friend in the world. After only a two hour break, we headed back out for a birthday party at a splash pad. It was a stretch, but we did it. A year ago, we were still sticking to our strict “one activity a day” policy no matter what, and now look at us! A class, lunch, and a birthday party in the same day! 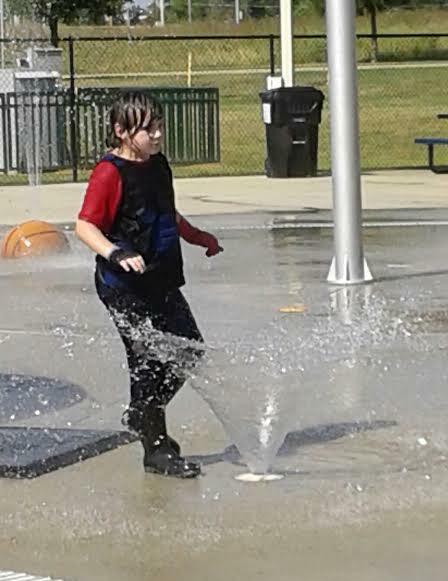 Well, once again, I could not for the life of me convince him to dress appropriately, so he arrived at the splash pad decked out in…two shirts, gloves, and pajama pants…and rainboots! Awesome. He was a bit more aggressive than I would have liked and I had to keep eagle eyes on him at all times, which gets absolutely exhausting. There was one embarrassing moment during snack, when all the adults were chatting away with each other and all of a sudden from the kids table there comes a shrieking growl-scream. Everyone ceases talking at once and stares at my child, from whom the sound is emerging, on top of the snack table in all the other kids’ faces. Well, I pulled him out and we had a good talk and I went back to pretending to be normal. We were barely able to make it through cake and presents and then we were outta there. But, guys, he DID IT. And that, my friends, is the sum total of a successful homeschool week with a special needs kid. I mean, of course, that I left out tons of details of all the schoolwork and all the feeding and cleaning and feeding and feeding. And feeding. It is perfectly exhausting. But when I think of how far we’ve come, it is worth it. Have you ever wondered what it is like to travel with an autistic child? We were blessed with a family trip to Dallas this weekend. An overnighter! My Mom has been working out of town for too long and missed her grandbaby, so we met up with her for a weekend of eventfulness. Here is a breakdown of our action packed weekend. Is it different from a “typical” family experience? I don’t know, I’ve never had a typical family. You’ll have to tell me. 1. Two days before leaving, meticulously decide as a family what to do on your trip. Decide to visit the Grapevine Mills Mall. Go over all options with Child. Child decides that he wants to visit the children’s aquarium, but is definitely not interested in Legoland. Respect Child’s choices. 2. Child wakes you up 5 times the night before the trip. 3. On the day of your trip, leave home at 8:30. Realize that Child does not eat breakfast until 10:30 every day. 4. Stop at a gas station at 10:30 to acquire breakfast for Child. Screaming and crying ensues because said breakfast burns Child’s lip, which he constantly chews into shreds for no apparent reason. Child does not eat breakfast. 6. Stand in line for children’s aquarium for 10 minutes. Before buying tickets, Child informs you that he is hungry. 7. Find food court. Give Child food. 8. Return to aquarium. Stand in line for 5 minutes. Child informs you that he has made a mistake. He would really prefer Legoland over the aquarium. 10. Stand in line at Legoland for 20 minutes. Legoland employee informs you that they are currently selling tickets to get in 5 hours from now. 11. Buy combo tickets for Legoland and aquarium. 12. Stop outside of Legoland and frantically dig in your purse for anti-anxiety medication. Realize you left it at home. 13. Return to aquarium. All family members thoroughly enjoy the experience. 14. Shop at the mall. Child insists that we must always walk on ramps, never stairs. There are stairs everywhere. Walk on ramps. 15. Child informs you, mostly with grunts and gestures, that his legs are achy and the shopping must cease immediately. Communication is now at roughly 25%. 16. Decide that Child cannot remain at mall long enough to experience Legoland at your designated ticket time. 17. Stand in line at Legoland for 15 minutes. Change ticket time to the following day. The only time available is 12:45…naptime. Take available ticket time. 18. Endure embarrassing meltdowns while getting Tired Child to car. Incite additional meltdown by forgetting the Ramp Rule and taking stairs. 19. Check into hotel room. Let Child swim. Swimming is seriously the BEST activity for calming Child’s overstimulated sensory system. Watch the anxiety melt off Child. Vocabulary resumes full capacity. 20. Lament once again the absence of anti-anxiety medication as you contemplate going to Dave and Buster’s for dinner. 21. Stick with the plan. Go to Dave and Buster’s. Have dinner. Child eats approximately 3 bites. You are satisfied. 22. Play games at Dave and Buster’s. Be amazed that Child is still functional because your own sensory system is wildly overloaded. Everyone has tons of fun. 23. Child chooses prize for the tickets your family earned gaming. He really wants the purple Minion from Despicable Me 2, but doesn’t have quite enough tickets. Child settles for Raphael from TMNT with little pouting and much gratitude. Be proud of his maturity. 24. Return to hotel 2 hours after Child’s bedtime. 25. Deposit Child in Grammy’s room and kiss him goodnight. 26. Close door to your adjoining room and do a happy dance because you get to sleep through the night! 27. Fall face-first into bed. Fall asleep immediately. 28. Ten minutes later, Child appears and announces that he is sleeping with you. 29. Toss and turn relentlessly until Child realizes that three really is a crowd and returns to Grammy’s bed. 30. Sleep through the blessed night. 31. Remain in hotel for the morning because monsoon has arrived in Dallas. Vow never to leave anti-anxiety medication at home again. 32. Arrive at Legoland at your designated ticket time. 33. Walk aimlessly around Legoland not touching or participating in anything. Realize Child is just getting his bearings. 34. Child plays on playground. Relax on bench and remember when you would have been worried he’d hurt someone. Be thankful for and proud of his progress. 35. Child makes plans to build a car to race on ramps. Realize you have the mechanical ability of a chimp and allow Dad to build cars with Child. 36. The family wants to see a 4D film at Legoland. Child vehemently protests. Remind Child that this is the family’s vaction, not his vacation. 38. See 4D film. Child does well. Be proud that he respected the wants of the group, even if reluctantly. 39. The family wants to ride the Save the Princess Ride. Child vehemently protests. Remind Child that this is the family’s vaction, not his vacation. Remember that repetition is good. 40. Ride Save the Princess Ride. Shoot lots of bad guys. 41. Leave Legoland and head for the last stop of the trip. The Rainforest Cafe. 42. Child loves the animated animals all around the Cafe and pretends to gain creature powers. Coolest place to eat ever. Child eats one bite. He has a tummy ache. Trips always mess with his stomach. 43. Say goodbye to Dallas and head home. 44. Put Child to bed. Breathe. 45. Take a hot bath, wonder if you’ll ever be ready for Disney World, and prepare to homeschool Child tomorrow. Javan’s service dog in training, Rosco, is almost finished with his training and ready to become full-time working dog and family member. He has been visiting our home for a week now, and I’m reminiscing about our visit as we’re getting ready to bring him back to the trainer tomorrow. We’ll wait two more months while he completes his training, and then he’s home forever! I’m tearing up a bit as I write that because I will miss him so very much. But, I’ll let you in on a dirty little secret: It’s easier when he’s not here. I know what you’re probably thinking. Why would I spend the money and go to the trouble of getting a service dog if it’s easier when he’s not here?!?! The answer is simple: It’s better when he is here. It’s hard to have a new dog around. 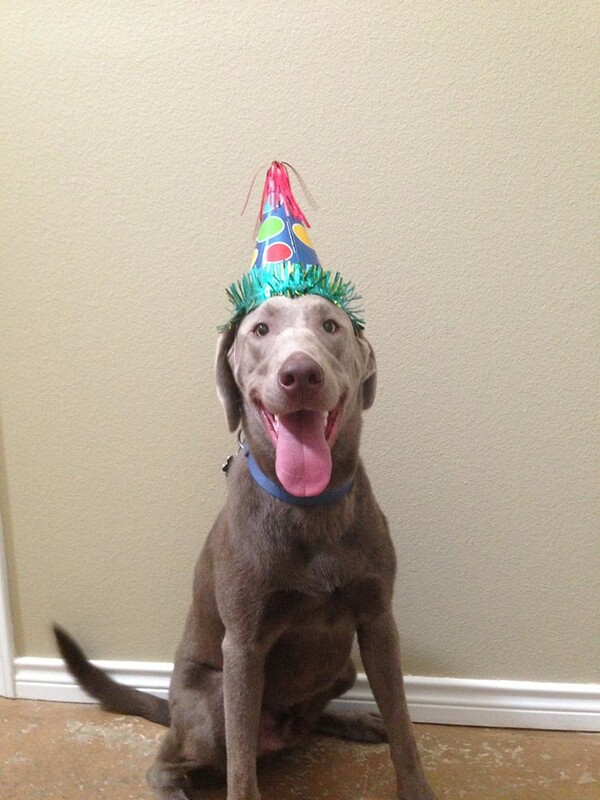 Especially one as young as Rosco, who just celebrated his first birthday a week ago. And especially when I have two other dogs at home who are very used to things being “their way.” There’s extra energy in the house that can be stressful.The dogs have to be separated at times to calm down. It’s an extra mouth to feed. I have to remember to give him his medicine, make sure he goes potty, gets enough water, gets rewarded with treats for good behavior, doesn’t eat shoes or stuffed animals, gets his training in every day, bonds well with Javan…the list goes on and on. I have to hold a leash everywhere I go…even when I could really use both hands free to carry groceries or hold open a door while I’m carrying a drink (or two). I have to remember to focus on him during meals out and make sure he stays down and behaves around other people and their food. The main idea: It’s a lot of work. It can be frustrating. Exhausting. Embarrassing. Communicates better. He relates better to those around him. He has something to talk about with people: Rosco. He’s less hesitant to talk to people he doesn’t know well. Is more aware of his surroundings. He is mentally where he is physically. He is more grounded to reality. He’s much less likely to be off in his own world, and much more likely to be where we are. Part of this is because he has to pay attention to what Rosco is doing. 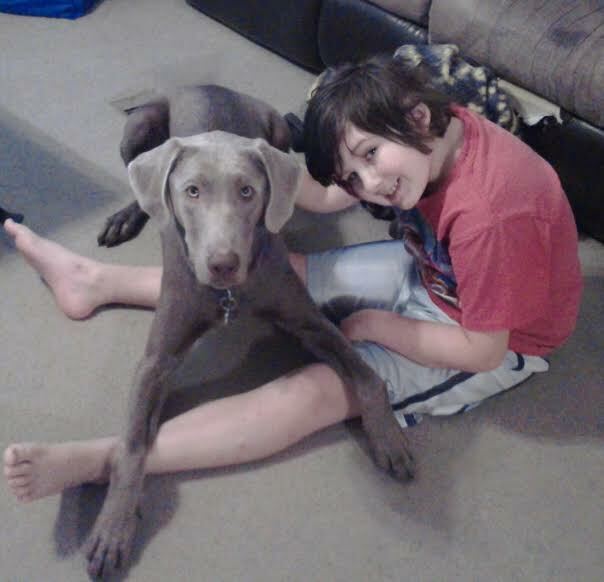 Part of it is that the physical connection to Rosco keeps him in reality. Is more independent. I have Rosco on a leash. Javan is also attached to Rosco with his harness. This allows me some modicum of control over Javan’s physical movements without me holding on to him. He can walk in the store without having to hold Mom’s hand and without me having to deal with him constantly running over to whatever catches his eye. Is more confident. He feels like he has control over Rosco with his commands. His words are powerful because Rosco obeys them. Rosco, this huge strong beast of a dog, obeys him. Is more selfless. Javan can understand when Rosco’s needs surpass his own. That’s an important life skill that can be very difficult for those with autism: putting others first. Rosco’s basic physical needs like eating and pottying will sometimes have to take precedence over Javan’s wants. I’m sure there are even more benefits than that. I’m sure those benefits will only grow as Javan’s relationship with Rosco grows. One day, I won’t need to hold the leash. One day I will pass the leash to Javan. One day things will be easier. Until then, they will be better. I don’t know if it’s a side effect of the current medication we’re trying or if my son is developing a psychotic disorder, but Javan has been experiencing an onslaught of hallucinations lately. Not all day, every day. But usually at least once a day at some point. Some scary, some benign, some annoying, some ridiculing. And to be honest, I have absolutely no idea how I am supposed to handle that. I comfort and reassure him as I can, but aside from that I don’t know how to treat the hallucinations. 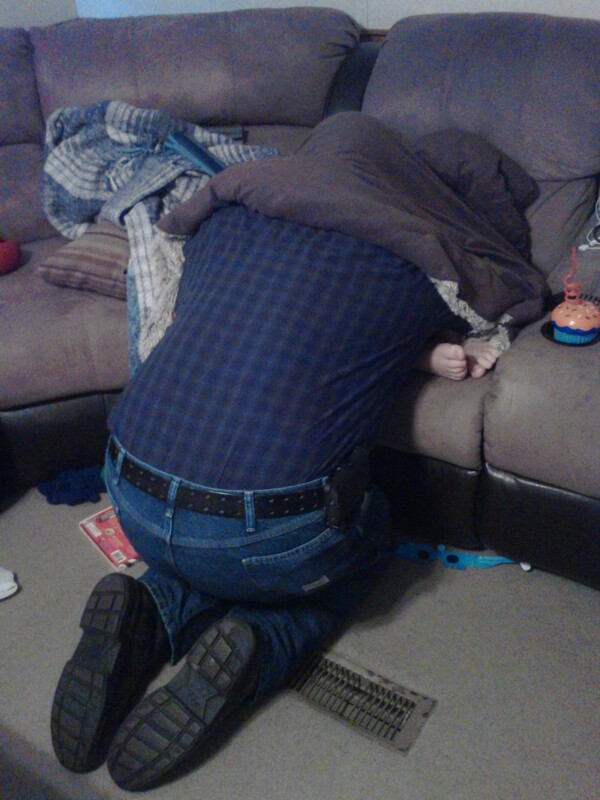 Japheth just climbed right under that blanket without hesitation. He knew what to do. He knew what his little boy needed. He broke down Javan’s defenses in order to let Javan feel his strong arms wrap around him and look him in the eyes and reassure him that he was safe. I don’t know all that passed between those two in that moment, but I recognized the beauty of it immediately and snapped this photo. You can see our mess. That’s just life. But what what you see under the blanket is Life. It’s the real thing. And I thank God for this husband, this father, who lives Life with gentleness and grace and strength. I don’t know what I’d do without him. I love you, Japheth. This life can be so hard to process, can’t it? It’s moving faster than I am and I don’t have time to catch my breath, let alone ponder the past or the future. It’s all about the present. I find myself wanting to share tonight not because I’ve finally found the time to catch my breath, but because today made me gasp, and that’s a sort of breath in its own right. I knew with a clarity I normally don’t possess in the middle of…that…what was going on. That’s Thumper the Grasshopper! 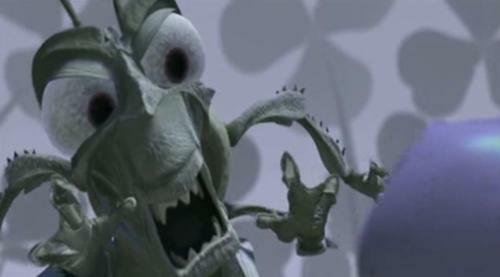 From the movie “A Bug’s Life!” Do you know who Thumper is terrifying in that picture? An ANT. The teller represented an ant to him: a threat. He had determined this to be a dangerous place and so she must be a dangerous person. He was protecting me. By the way, the sound Thumper makes is this snarling, growling sound. Very intimidating. Not really your typical bank noise. So, I manage to coax him into a seat, explaining that she was safe and we were in a safe place. He didn’t buy it. I gave him a sucker. That worked somewhat better. What I didn’t do, that I normally would have, was scold him. I told him we can’t make faces or sounds like that to other people, but he wasn’t in trouble. Because I saw this situation through his eyes. I knew that he was responding to a perceived threat. I saw the anthill and the ants that weren’t there. And I wondered, how many times do I miss the anthill? How many times do I yell and berate and, you know, other things I shouldn’t do, or even justifiable punishments like time outs…because I don’t see the anthill that’s so huge and obvious and threatening to him? I only see his actions as actions, as choices, rather than what they may really be: reactions. Reactions to things that may not even be real to me. And how must it feel to him when I punish him for reacting to the ants? Maybe even reacting to save me from them? No wonder he gets so angry with me. No wonder he sometimes refuses to trust me. To him, my behavior and reactions in those situations must make no sense whatsoever. To him, it must feel so unfair when I punish him. He doesn’t know I can’t see the ants. It’s so easy to see his hitting, growling, rudeness, and just punish. And I’m not saying I won’t or shouldn’t punish. I’m not actually sure “should” will ever exist for me or my family again. I’m just saying I wish I could see better. I wish I could see the anthills and the ants that he sees. The threats and the things of this world that he perceives so differently. I wish I could understand. But Javan’s version of reality will always be different from mine, and as much as I strive to see what he sees and understand his version of the truth and what is real, and as many tiny glimpses as I get into his world, I’ll never really get it. The truth is, his version of reality seems to be getting farther and farther from the norm. More and more of the things he does are so completely out of the norm that comprehension totally fails me. Some of them are dangerous, some are hurtful, some are just different. More and more of the thoughts he thinks seem so bizarre and I don’t know where those thoughts could possibly be coming from. Things seem more dire right now because his medication just isn’t working to keep these – delusions? – at bay. We’re in week two of a six week medicine change, weaning off one med and slowly introducing another. The medicine change could possibly help. It could also possibly make things worse. Whatever is happening, his psychiatrist does not feel that it is autism related. It is most likely the bipolar mood disorder. We go to a new specialist in two days to do three and a half hours of psychological testing to determine Javan’s level of reality testing. That means, can he tell what is real and what is not and how often can he tell those things? Maybe this will at least give me some clue as to how many anthills there are, even if I can’t see them.